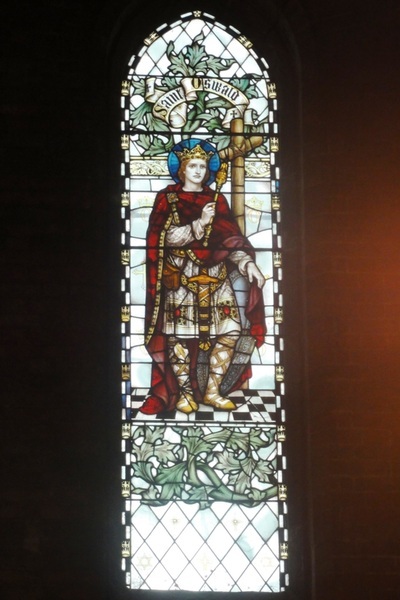 St Oswald (detail), window in the sacristy lobby by James Powell & Sons, 1915. The two windows on the liturgical south wall of the sacristy lobby (to the right of the chancel) are dedicated to the memory of the Pope brothers, Cyril and Reginald, who were killed in the Great War. The windows were made by James Powell & Sons and installed in 1915. Lieutenant Cyril Montagu Pope, of the 2nd Battalion of the Worcestershire Regiment, died on 24 October 1914 of wounds received leading a charge in the Polygon Wood, in the First Battle for Ypres. He was 26. His window depicts St Wilfrid (633–709), founding bishop of Sussex, who is shown holding a fish, a reference to the legend that he converted the local pagans by teaching them how to fish. 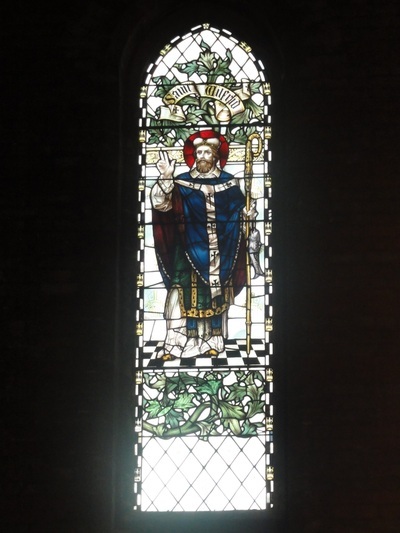 The window also features masonic symbols (Cyril belonged to Brighton’s Royal Clarence Lodge, no. 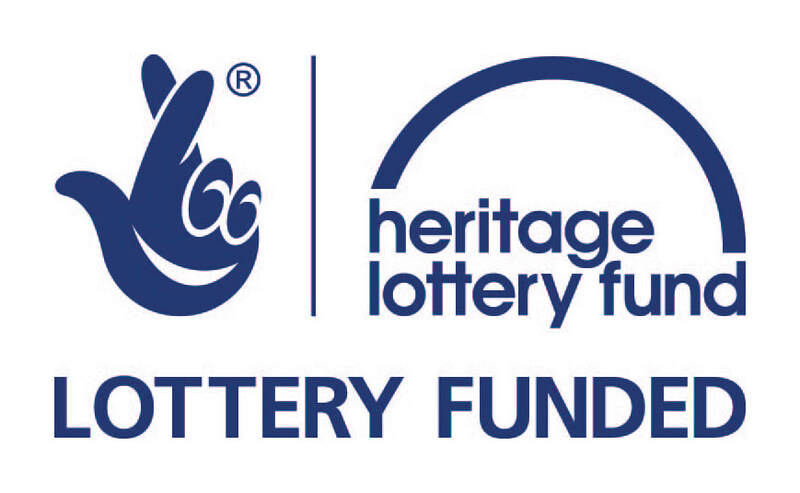 271) and the insignia of the Church of England Men’s Society to which both brothers belonged. There is another memorial to Cyril at Winchester College. 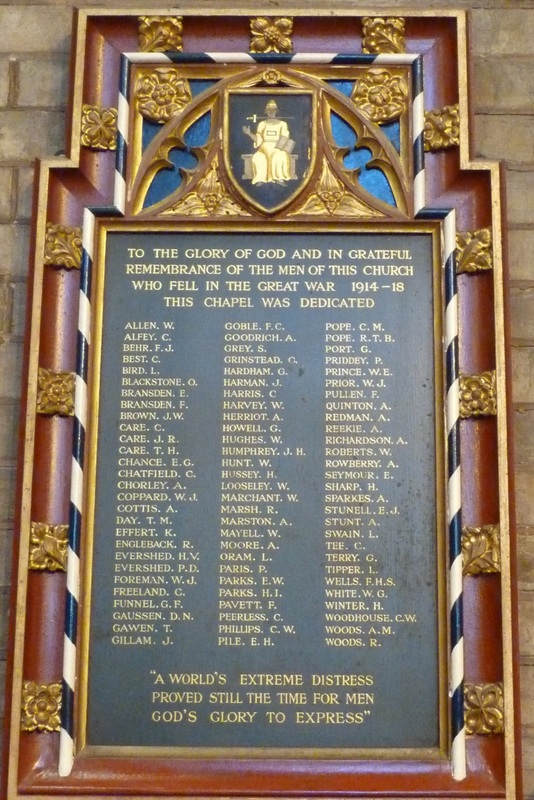 Cyril's younger brother, Reginald Thomas Buckingham Pope, was killed by a sniper, also near Ypres, on 16 February 1915. He was 23 years old and a Lieutenant with the 1st Battalion of the Welsh Regiment. 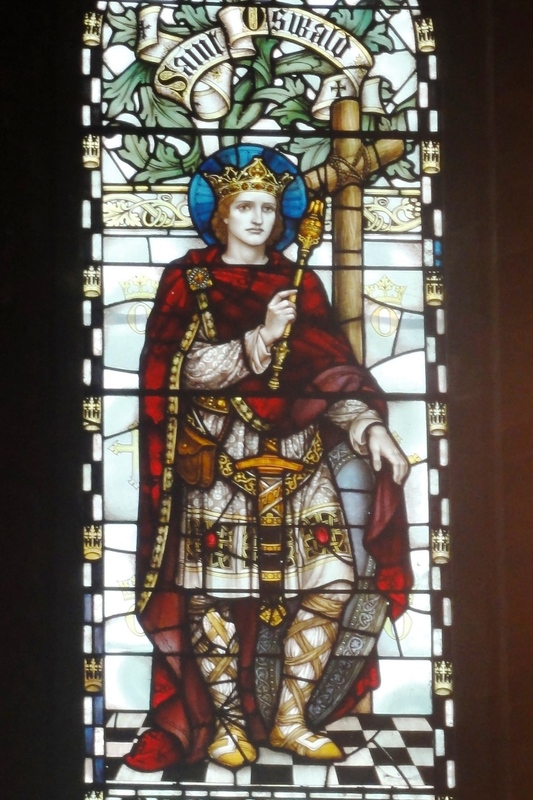 His window depicts St Oswald, the Christian warrior king of Northumbria, who was killed fighting against the Mercians in the Battle of Maserfield, near Oswestry, in about 641. 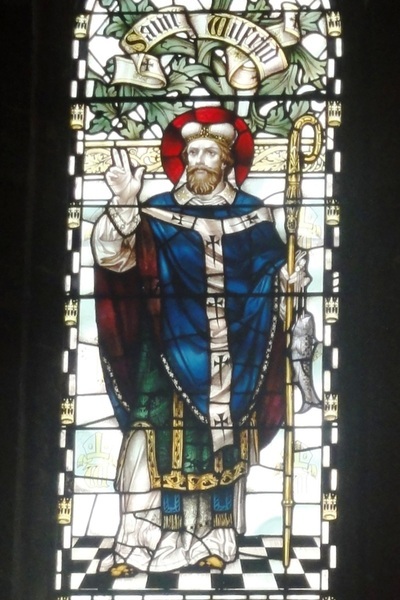 The cult of St Oswald took root soon after his death, and he was quickly established as a national hero who had been martyred in battle for faith and country. The Pope brothers were sons of the late Reginald Barrett Pope, a Brighton solicitor and former churchwarden of St Mary's, and his wife Mary Richardson Reid. Another son, Eric, survived the Great War. 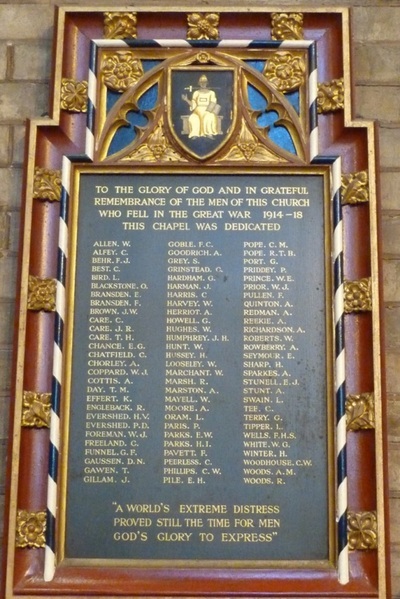 In 1924 he presented an altar to church's Chapel of Remembrance in memory of his brothers. The altar, with gilded riddle posts and angels, remains in the chapel today.